1. Not being taken seriously – Many women feel like they aren’t given the same respect as their male counterparts in the workplace. Whether in a meeting or interview, sometimes its easy to not believe that the young woman in a designer dress and neatly plated hair is capable of coding an algorithm designed to compute the trajectory route of the east coast's next hurricane or create the next social media fad. 2. Male-Dominated Management: It’s easy to feel intimidated or underrepresented when the majority of the managers you come across are of the opposite gender. With only 23% of technical positions managed by females, the numbers speak for themselves. How to overcome: Strive to break this statistic; instead of feeling defeated by it, become determined to rise to your full potential. Study characteristics of good leaders: honesty, listening skills, empathy – and exhibit them. In most cases, managers aren't promoted based off of their gender, but the leadership qualities one possesses. Show your managers your worth by putting in the hours, sharing your ideas, and showing your determination for your team to succeed. 3. Technical Knowledge: The number of females with technical degrees is decreasing. Many female technologists find that they never dreamt of a career in tech, yet found themselves pursuing a tech career. With so few women obtaining technical degrees, how can the amount of women in tech increase? How to Overcome: More so than other fields of study, technology is always changing. Self taught coders saturate the market and their knowledge is just as extensive as those who graduated 10 years ago with technical degrees. Lucinda Duncalfe, CEO of Monetate, looks back on her entrance into the tech world, saying, “I started in tech accidentally. After graduating I took a job as a secretary for a VP of Sales for a company that turned out to be a Silicon Valley startup, though in the mid-80s none of us knew what those were. I was soon doing a bit of everything, including some programming in their proprietary scripting language, though we didn’t call it that then. I loved the company, but still wasn’t sure I wanted to be in business, much less in tech. Nonetheless, here I am 30 years later, in my fifth tech startup.” Without formal technical schooling, Lucinda has accomplished more than many IT graduates can say and has even been awarded Eastern Technology Council’s Enterprise Award for CEO of the Year, all with a Psychology degree. Make it a point to constantly learn, ask questions, and inquire. As more and more technologists rely on their hands on knowledge, degrees in the technical world will become more and more obsolete and your path into a tech career can be as unique as you are. 4. 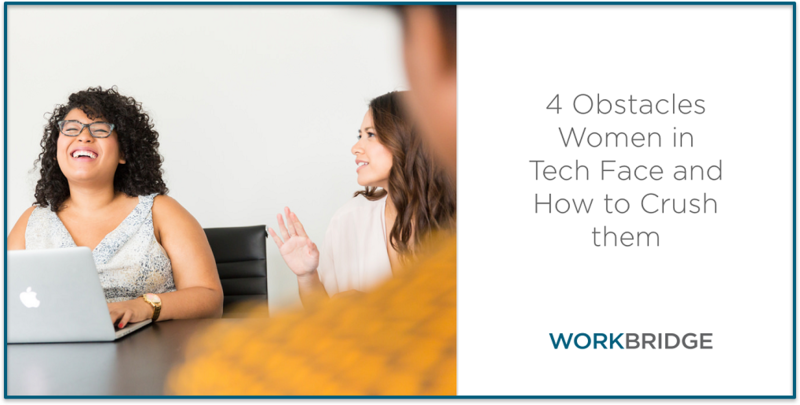 Always feeling the need to talk about being a woman in tech – Women in technology need to stick together, right? Why do women in tech always need to talk about the fact that they are women in tech? Why do we need more female technologists? How to Overcome: Many women feel the need to defend their roles and career successes and praise others', specifically because of their gender – but know you don’t need to. Instead of focusing on increasing the number of women in tech, focus on diversification as a whole. On increasing the number of women in tech, Cassy Rowe, head of UX/Design at Scoop takes a less voiced stance. “To be candid, I don't necessarily try/target/push for more of any particular gender/race/etc purely because of their gender/race/etc. I frame the conversation differently. I don't see that we need more women in tech purely because we need more women, but I do see that we have a lack of women.” Instead of pointing out our differences, focus on what makes us all the same: a passion for technology. No matter how many more young (female) technologists strive to be the next award winning CTO or UX/UI designer it is still going to be awhile until the statistics fall in their favor. Until then, continue to make strides, innovate & be more than just a woman in tech.